Occupation: Business owner. State of Residency: VIC. Favourite place in Australia: Australian Alps. Upon arrival: Surprised by the Australian accent. 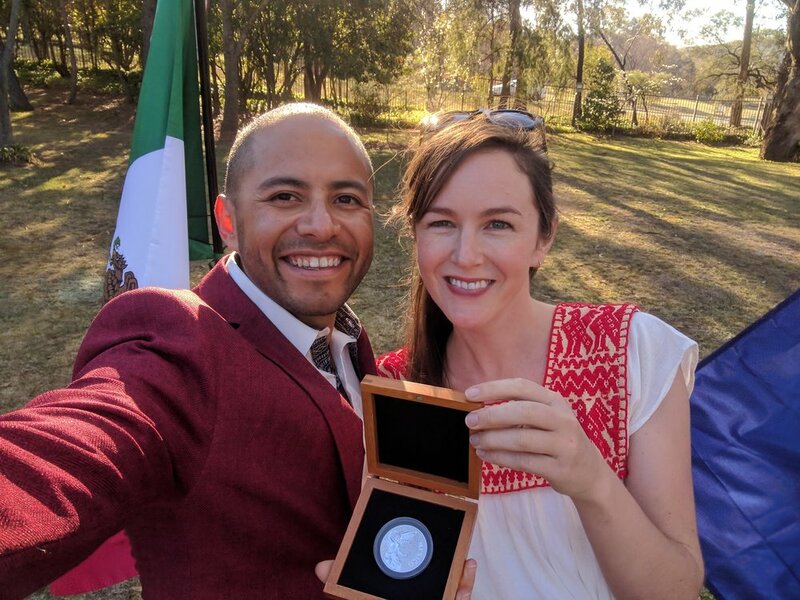 Gerardo is a passionate Mexican entrepreneur and adventurer who, alongside Diana Hull, co-founded La Tortilleria, a traditional Mexican tortilla bakery in Melbourne that supplies authentic corn tortillas to grocery stores and restaurants across Australia and South East Asia. He was recently awarded the Mexican Federal Government’s award for Outstanding Mexican Abroad, becoming the first Mexican-Australian to receive this honour. This highly selective award honours Mexicans living overseas who have made a valuable contribution to raising the profile and enhancing the image of Mexico in foreign lands. Gerardo is also the 26th Mexican to climb Mount Everest to the summit. Creates awareness and understanding of authentic Mexican food. Contributes to Australia’s cultural diversity and provides a sense of pride and belonging amongst Mexicans living in Australia. An event that exemplifies this is the Earthquake Fund Relief event organised in 2017 which raised $20,842. This event gathered the Mexican community and their non-Mexican friends together in a time of great distress and gave them an avenue to help and heal. Provides employment and career development opportunities to over 50 people. Provides a healthy and nutritious Mexican staple (the tortilla) to Australians. Gerardo is the 26th Mexican to climb Mount Everest to the summit. After finishing my engineering degree in Mexico, I moved to London to study a Master in Science in Information Security. Shortly after graduation, I was head hunted by Deloitte and moved to Los Angeles to start my professional career. In May 2009, I fulfilled a lifelong ambition to climb to the top of Mount Everest, being the 26th Mexican to do so. This experience showed me that anything is possible if you put your heart and mind to it and inspired me to expand my horizons and seek a new life in a different country. While sitting in a tea house on the walk back from Everest Base Camp, I spotted a world map on the wall, and Australia just stood out for me. It was the furthest point I had not been to, and seemed like a place of exciting adventures. Maybe it was destiny, but after requesting a transfer within Deloitte, I landed in Melbourne in October 2009 and from the day I knew I had made the right decision. The warmth of the people in Melbourne captivated me and I felt welcomed, but there was one thing missing: limited authentic Mexican food like what you find on the streets in Mexico. The culinary richness of actual authentic Mexican food was largely unknown. I enjoy sharing my culinary heritage with my new homeland, so I was regularly hosting dinner parties to show my new friends how incredible Mexican food is. But I knew I wanted to contribute on a bigger scale. Around this time I met Diana, an Australian anthropology student who had studied in Mexico and shared my passion for Mexican culinary heritage. In 2012 things began to change in the Mexican food scene: A few restaurants were starting to embrace authentic Mexican and people who had travelled to Mexico talked about the lack of real Mexican food here. The issue was getting the right ingredients, most importantly, the staple of Mexican cuisine - the corn tortilla. The only ones widely available here at the time were either imported frozen from the US, or made here from an imported ‘instant’ tortilla flour. Being passionate about sustainability and low food miles, Diana and I knew there was a gap in the market and we could fill it by creating a local 100% Australian alternative that included cooking and stone grinding our own corn to make the tortillas from scratch. In March 2013 La Tortilleria was born in a quiet backstreet of an industrial area in Kensington. Getting it off the ground was hugely challenging and involved overcoming quite a few obstacles. We had no guarantee that making authentic corn tortillas from scratch outside of Mexico would actually work and we had no industry model to guide us. With as much careful prior research and self-belief as we could muster, we took a leap of faith. Word got around the Mexican community that there was now a place they could buy fresh nixtamal tortillas and food from back home. This then spread to the mainstream and within the first few months of opening there was a line out the door and the local food media reviewers were keen to write about us. Mexican restaurants started approaching us to start supplying them wholesale. Over the past 4 years, we have grown from a small neighborhood bakery to Australia’s leading supplier of authentic Mexican corn tortillas, which last year produced over 9 million tortillas and employees more than 50 passionate individuals. We currently supply almost all the top-rated Mexican restaurant in Melbourne, and many more in each other major city. Our retail and wholesale products are available in every state and territory in Australia through our network of distributors, and we now export to South East Asia and New Zealand. Starting a business - We began the business on a very tight shoestring, which in itself presented a lot of challenges. During the first year Diana and I were very hands-on, wearing most of the hats ourselves to keep the costs down. We had to reinvent ourselves into a world we didn’t know much about. We cooked, waited tables, cleaned, made tortillas and did the admin and management duties. We would not have got through this if it wasn’t for the strong support network of friends, neighbours, our beloved customers and of course our incredible team. Very long hours - I had to maintain my full-time job in order to funnel much-needed extra cash into the business, so this meant working 90+ hour weeks. I would wake up early in the morning to help make the tortillas, go to my day job, and then return straight after work for the dinner service. Afterwards we’d stay until 11pm or later to cook the corn ready to do it all again the next day, including weekends. At times like these, grit is what gets you through! Sourcing key materials – Here in Australia it is not very common to find corn other than sweet corn; the type of grinding corn we needed for tortilla making is hard to come by. Finding farmers who could grow our corn for us took many months of investigation and planning. Stereotypes about Mexican food - When I first arrived in Australia, there was a misperception that “Mexican food” consisted mostly of hard-shell tacos, burritos and other US-based ‘Tex-Mex’ dishes. This perception is changing, and people are started to learn about the traditional foods that are actually eaten in Mexico. The contributions by restaurants, Mexican produce suppliers, and Mexicans living in Australia has been pivotal in generating this change. The fact that Australian consumers are starting to acknowledge the difference between Mexican and Tex-Mex is a great start. Take a leap of faith - Take a chance and give all you have to something you believe in. It might not always be easy, but it will be bloody rewarding! For La Tortilleria, it was a long journey of long days, persistence, and constantly riding the intense learning curve. Australia is a land of opportunities for those who are willing to give it a go. I like to think that passion and drive can overcome any obstacles. Put your passion before work – stop doing things that do not align to your personal and professional goals and do more of the things that have a meaning to you! When you give a purpose to the trivial and routine tasks you are doing, they suddenly become enjoyable and you start moving faster through them. Gerardo would like to see La Tortilleria continue to grow and reach more people in the region, and the world – why not? – who can enjoy their authentic corn tortillas and other products they are planning to bring into the market. All of this whilst assisting other immigrants to Australia to fulfill their own dreams of establishing themselves here through more employment opportunities, mentoring and community service. In addition, he is currently working on a project to fulfill his personal ambition of filming a TV show in Mexico to showcase the beauty of Mexico and richness of Mexican food to the Australian audience. Finally, he would like to climb a couple more 8,000+ meters mountains and complete the crossing of Antarctica unassisted.